Mid-market companies are looking for complete solutions from the solution providers who know their businesses and specialize in a particular solution category such as warehouse management or supply chain integration, within their industry. In order to provide an environment for the business solution, either the solution provider or the end customer must obtain the software needed to run the provider’s application program. This software normally consists of a database, a Web server, and an application server. These components, which are not actually part of the business solution, but are required to support the application program, are called middleware. The process of obtaining, installing, configuring, and supporting the middleware components is a complex process for the solution provider, who currently has to absorb the cost of setting up the environment. The provider has to work with multiple suppliers who have multiple terms and conditions, different license structures, and multiple departments to work with on the contracts and support structures, all of which leads to added infrastructure costs and inefficiency. IBM designed the Express Runtime offering to address the needs of the solution providers serving mid-market customers. The main design criteria were reducing complexity for the providers by offering a pre-integrated and pre-configured middleware solution with a single contract, one license, one set of contracts, and a very competitive price. With Express Runtime, you get WebSphere Application Server - Express, DB2 UDB Express, and IBM HTTP Server with a single install, one contract, and a significantly lower cost compared to purchasing the individual components. Express Runtime includes quick start samples and documentation to get you up and running quickly and easily. Chapter 2. 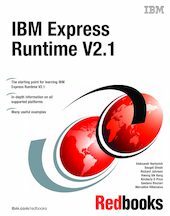 What's new in IBM Express Runtime V2.1? Chapter 5. What's a wrapper?